A petition calling on the Isle of Wight council to abandon plans to cut £70,000 funding to the Law Centre has attracted over 3,000 signatures, ensuring it will go to full council for debate. Colleen Brannon explains the impact of the proposed cuts. 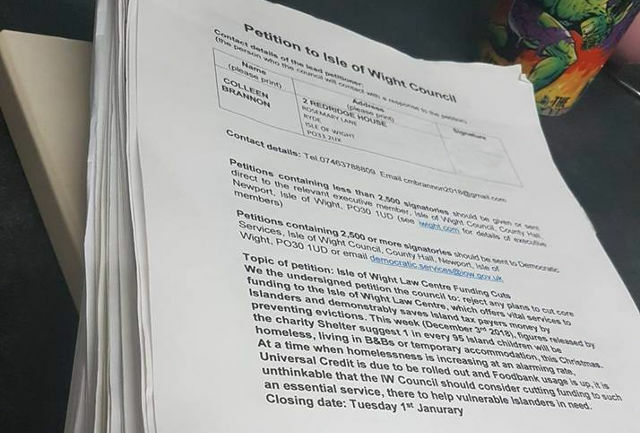 A petition launched by Island Labour, that has attracted over 3,000 signatures, has been submitted to the Isle of Wight council. It demands the Isle of Wight Council abandon any plans to cut funding for The Law Centre. As reported by OnTheWight in early December, a ‘saving’ of £70,000 from next year’s Isle of Wight council (IWC) budget, could end up costing the council in excess of £1.5m each year. Those were the claims of the Law Centre, who approximated their interventions had helped save £1.5m-£2m for the council in the last year. The loss of funding would also result in the loss of 12 jobs at The Law Centre. Since the petition was launched a whopping 2,013 signatures have been collected online, whilst Island Labour members and Unite Union IW members collected 1,025 in person on the streets of Newport and by knocking on doors. “What I really hope people understand, is that truly anyone could find themselves in need of help from the Law Centre. People always think it happens to someone else, but a car accident, stroke, false accusation, whatever…any one of us could need help. “It’s such an essential service. Cuts to legal aid have already made justice a privilege for the wealthy few, and not the inalienable rights for all, as it should be. It’s scary, when you actually think about it. We need the Law Centre now more than ever. The petition from Island Labour can still be signed online, if you wish to support it. However, the Law Centre argued the IWC response to the news was “meaningless”. The next stage is for the petition to be presented to the full council. We’ll update you once dates are confirmed. 2 Comments on "Over 3,000+ call for Isle of Wight Law Centre funding cuts to be scrapped"